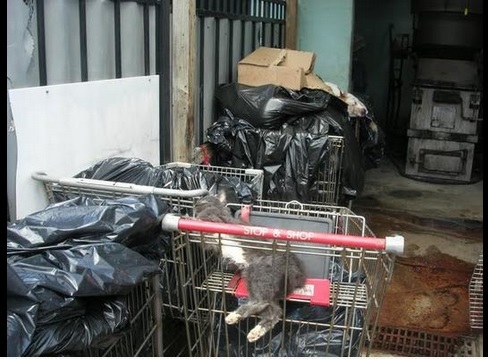 Photo of discarded dead animals from a 2009 Office of Animal Welfare inspection report of Associated Humane Societies – Newark. The Executive Director at the time is still in charge of this shelter today. Most New Jersey animal shelters voluntarily report detailed data to state authorities. 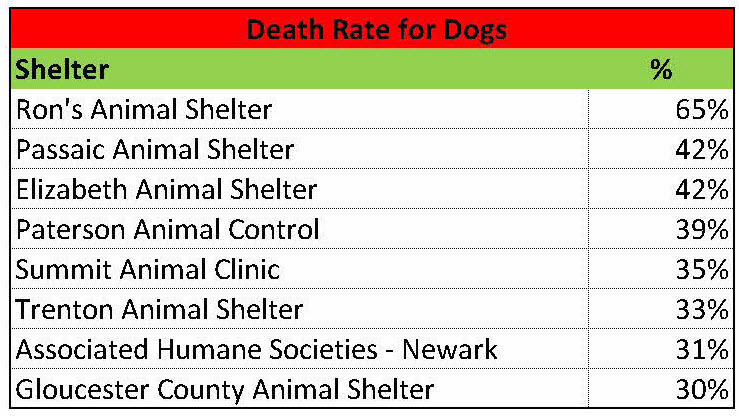 Last August, I shared New Jersey’s animal shelters summary statistics on my Facebook page. Each year, the New Jersey Department of Health’s Office of Animal Welfare requests each licensed animal shelter in the state to submit animal shelter data for the previous year. Animal shelters voluntarily submit this data in the “Shelter/Pound Annual Report.” The Office of Animal Welfare takes these Shelter/Pound Annual Reports and compiles the number of dogs, cats and other animals impounded, redeemed, adopted and euthanized to prepare its Animal Intake and Disposition report. However, the Shelter/Pound Annual Reports include additional information on how animals were impounded (i.e. strays, owner surrenders, rescued from in-state facilities, rescued from out of state shelters, and cruelty/bite cases) and disposed of (i.e. returned to owner, adopted, sent to rescue/another shelter, and died/missing). Additionally, the Shelter/Pound Annual Reports include the number of animals in shelters at the beginning and end of the year as well as the maximum number of animals facilities can hold. Thus, the Shelter/Pound Annual Reports include very important data not found in the Office of Animal Welfare’s summary report. I compiled the data from these reports and analyze the results in this blog. 2013 statistics for each New Jersey animal shelter are listed at this link. Several animal shelters, which reported statistics in prior years, failed to submit data in 2013. Specifically, Summit Animal Clinic in Union City, Associated Humane Societies – Tinton Falls, Mercerville Animal Hospital and Angel Pets Animal Welfare in Woodbridge disclosed this data in 2012, but did not do so in 2013. Additionally, East Orange Animal Shelter has never submitted Shelter/Pound Annual Reports to the state, but did share limited data with The Record newspaper. These shelters failure to disclose data raises serious questions. For example, are they trying to hide embarrassing statistics from the public? I’ve included these shelters’ 2012 data, and in the case of East Orange, its limited 2013 data in my analysis. Also, I performed my analysis without these shelters as well. Unless indicated below, I’ve included these shelters’ data in the analysis under the assumption the statistics would be similar if submitted to the Office of Animal Welfare in 2013. Most New Jersey animal shelters do not properly account for their animals. Simple math dictates the number of animals at a facility at the beginning of the year, plus all animals coming in during the year, less all animals leaving for the period, should equal the number of animals a shelter has at the end of the year. Stunningly, 69 out of 100 shelters reporting these dog statistics and 71 out of 98 facilities submitting this cat data failed to get this right. This raises serious questions about the accuracy of these shelters’ reported statistics. Even worse, 54 of the 69 shelters with flawed dog statistics and 46 of the 71 facilities with incorrect cat statistics should have had more animals at the end of the year then reported. While these errors could have been due to incorrect counts of the number of animals at facilities, the more likely answer is many outcomes, such as animals killed, dying, or gone missing, were not recorded. Given 71% of the errors were due to shelters having less rather than more animals on hand at the end of the year than they should have had lends credence to the theory that errors were mostly due to shelters failing to account for various outcomes. To put it another way, 3,231 cats and dogs should have had outcomes reported and did not. Thus, there is the potential that as many as 3,231 additional dogs and cats were killed, died or went missing from New Jersey animal shelters than were reported in the last year. Shelters may have failed to classify animals adopted out and sent to rescue properly. Both Paterson Animal Control and Elizabeth Animal Shelter reported no animals were sent to rescues and all dogs and cats leaving their facilities alive were owner reclaims or adoptions. However, rescues I know who work closely with these two facilities told me both shelters rarely adopt animals directly to the public. This makes sense as neither shelter advertized animals for adoption (i.e. no adoption web site or social medial pages) in 2013. One has to wonder how many other facilities failed to properly classify adoptions and rescues properly. This data is very important as it provides details on the burden rescues and other shelters are taking from these facilities. We need better oversight of New Jersey animal shelters’ data reporting. Currently, these statistics are voluntarily reported and most shelters are not taking this seriously. For example, I noticed a large number of reports were submitted many months after the end of the year. This data should be easy to compile since facilities can utilize animal shelter software programs, some of which are free, to do this task. 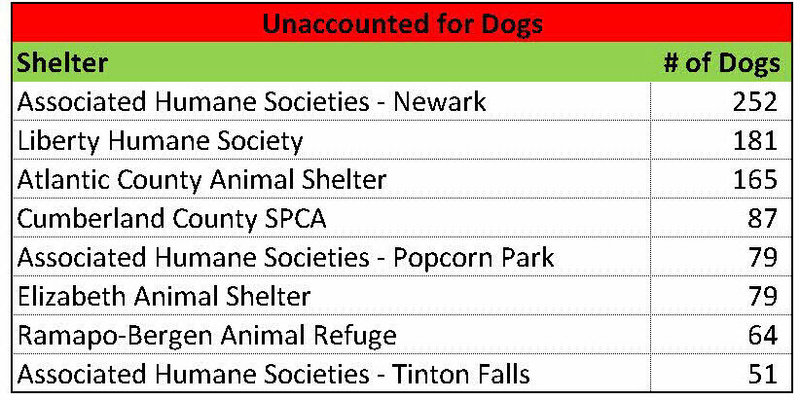 Furthermore, New Jersey animal shelter laws mandate facilities maintain much of the raw data found in the Shelter/Pound Annual Report. Unfortunately, Office of Animal Welfare inspections routinely find shelters do not properly keep records on animals. We need to make the Shelter/Pound Annual Report mandatory for animal shelters along with serious penalties for significant errors (especially if deliberate). In order for animal shelters to take data reporting seriously, we may also need to require audits of these reports. Thus, these results show we need stronger laws and the Office of Animal Welfare to play a greater role in ensuring reported animal shelter statistics are in fact accurate. The more detailed data in the Shelter/Pound Annual Reports allows one to more critically examine the percentage of locally impounded animals dying in New Jersey’s animal shelters. 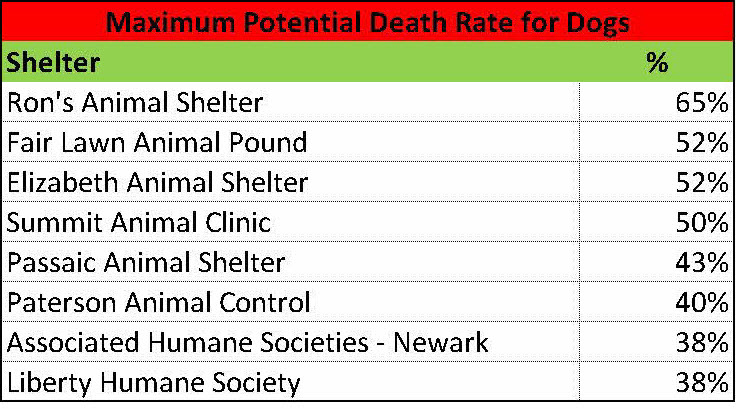 The following table summarizes my analysis of the kill/death rate calculated from the Office of Animal Welfare’s summary report and the data reported in the Shelter/Pound Annual Reports. The Animal Intake and Disposition report prepared by the Office of Animal Welfare only allows one to calculate the number of animals killed as a percentage of total animals impounded or intake. I prefer calculating the kill rate as a percentage of outcomes rather than intake as this metric directly compares positive and negative outcomes. Using intake depresses the kill rate since shelters can simply hold animals for a long time to the point of overcrowding. Calculating kill rate based on outcomes rather than intake increases the dog kill rate from 13.4% to 13.9% and the cat kill rate from 38.5% to 39.2%. To calculate the statewide kill rate, we must also back out transfers from one New Jersey animal shelter to another state facility to avoid counting animals still in the state’s shelter system or registering two outcomes for the same animal (i.e. one New Jersey animal shelter transfers a dog or cat to another state facility who then adopts out the animal). This adjustment increases the dog kill rate from 13.9% to 14.5% and the cat kill rate from 39.2% to 40.8%. In addition, we should increase the kill rate for animals dying or gone missing in shelters. I label this metric the death rate as these animals are likely dead or in a very bad situation. After making this adjustment, the dog death rate increases from 14.5% to 15.5% and the cat death rate rises from 40.8% to 46.8%. Also, many shelters transport easy to adopt animals from out of state which artificially increases save rates. 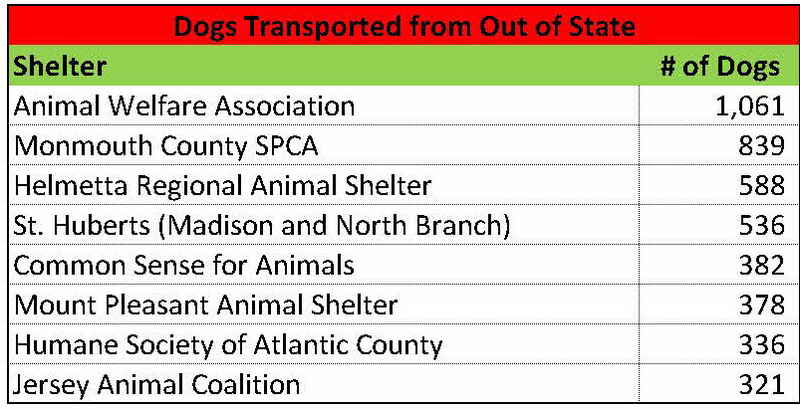 To properly calculate the percentage of New Jersey animals losing their lives, we need to adjust for transports. Unfortunately, shelters don’t break out their save rates by local and out of state animals. However, most likely nearly all of the out of state animals (primarily puppies and easy to adopt dogs) make it out of shelters alive. Therefore, I back out the number of out of state transports to estimate the local death rate. This adjustment increases the New Jersey dog death rate from 15.5% to 18.9% and the state cat death rate from 46.8% to 47.4%. Also, I estimate a maximum local death rate by including the number of unaccounted for animals described in the section above. Making this adjustment increases the maximum potential New Jersey dog death rate from 18.9% to 22.1% and the maximum potential state cat death rate from 47.4% to 49.5%. 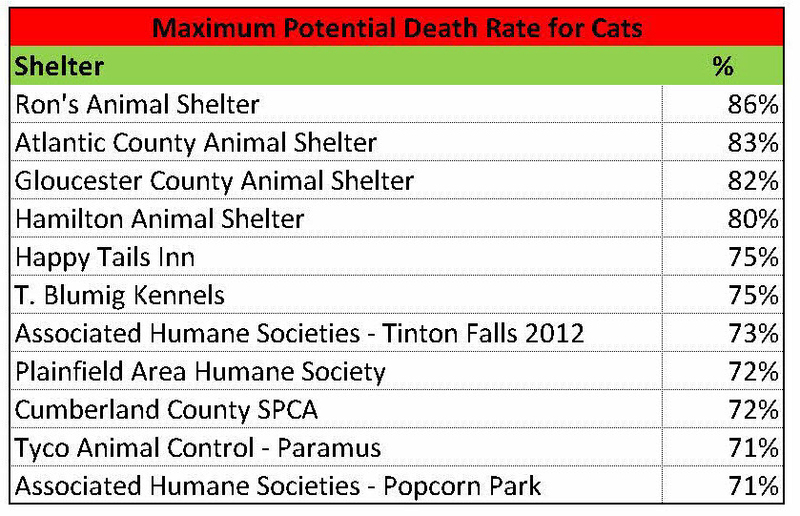 Finally, the maximum potential New Jersey cat death rate decreases slightly from 49.5% to 49.4% if I include the 2012 data from shelters who failed to report statistics in 2013 to the Office of Animal Welfare. Thus, the percentage of New Jersey animals losing their lives in our state’s animal shelters may be much higher than previously thought. New Jersey animal shelters transported 642 cats from out of state while nearly 50% of cats in the state’s animal shelters were killed, died or went missing. Animal Welfare Association (280 cats received from out of state) and Mount Pleasant Animal Shelter (211 cats received from out of state) rescued more cats from out of state facilities than New Jersey animal shelters. In the case of Mount Pleasant Animal Shelter, the organization’s Executive Director told me these cats were rescued from New York Animal Care and Control. One can only hope the out of state cats rescued by other New Jersey animal shelters came from nearby New York and Pennsylvania facilities rather than from shelters far away down south. Return to owners (“RTO”) rates are one of the positive results from this analysis. Overall, the dog and cat RTO rates of 52% and 4% are approximately twice the national average. As I noted in my blog on reuniting lost pets with owners, return to owner rates are highly correlated with socioeconomic status. Wealthier people likely have more resources/knowledge to license and microchip their dogs. Similarly, people with greater incomes are more likely to afford reclaim fees or ransom payments to animal shelters. New Jersey’s RTO rates for dogs clearly fit this pattern with shelters serving wealthy towns returning most stray dogs to owners while urban shelters are only returning about one fifth of lost dogs to owners. Clearly, we need to help people in urban areas get microchips and ID tags on their dogs. Additionally, we need to create pet help desks at shelters in these cities to help people pay the reclaim fees, which are often mandated by the cities themselves, when necessary. The statewide cat reclaim rate, like figures from across the nation, is still very low and suggests shelters need to figure out better ways to get lost cats back to their families. New Jersey should allow shelters to transfer stray cats to rescues during the mandatory 7 day hold period since few are returned to owners at shelters. This would open up space to save more cats and reduce the chance of disease (i.e. cats spending less time in shelters are not as likely to get sick). New Jersey’s animal shelters continue to fail the state’s animals. The state’s animal control facilities only impound 8.7 animals per 1,000 New Jersey residents. As a comparison, the average community in the country impounds anywhere from 14-30 animals per 1,000 residents based on estimates from Animal People Newspaper and the Humane Society of the United States. Despite New Jersey shelters impounding a fraction of the animals other no kill communities take in on a per capita basis, the state’s animal control facilities continue to kill and allow animals to die under their care. Even worse, many of these shelters can’t even properly keep track of how many animals leave their facilities dead or alive. Our state’s animals deserve far better treatment than this. Contact your local city council members and mayor and demand better from the animal shelter serving your community. We can do this so let’s get to work! Hi, I’d like to know more about where you pulled information for unaccounted for animals. I am the executive director of Ramapo-Bergen Animal Refuge and I’m very curious to see where that data came from as it is not accurate according to our records/managment. Thank you. Thank you. I’ll be looking into this on a deeper level. I think this may be an issue with data recording more than anything else. Hi, I’d like to know more about where you pulled information for unaccounted for animals. I am the executive director of Ramapo-Bergen Animal Refuge and I’m very curious to see where that data came from as it is not accurate according to our records/management. Thank you. I will not tolerate trolling on this blog so consider this a warning. Based on the tone of your post, it seems you may work for AHS or be quite friendly with its management. Second, per AHS’s own web site 3 of the 8 board members were there when these photos were taken. As for AHS-Newark’s “tremendous intake”, that again is not true. Per AHS-Newark’s own data, they only take in 8.95 dogs and cats per 1,000 people in their service area which is far less than national averages ranging from 14-30 dogs and cats per 1,000 people. Furthermore, no kill open admission shelters are taking in far more animals in total and per capita than AHS-Newark and are getting the job done. Kansas City, Missouri’s open admission shelter saves over 90% of its dogs and cats and takes in around two times as many dogs and cats in total and more than twice as many per capita. Similarly, Washington DC’s animal control shelter is close to reaching no kill. If AHS-Newark can’t handle their “tremendous intake”, then they should stop adding new animal control contracts, such as from the towns formerly going to Linden Animal Control and Jersey Animal Coalition. 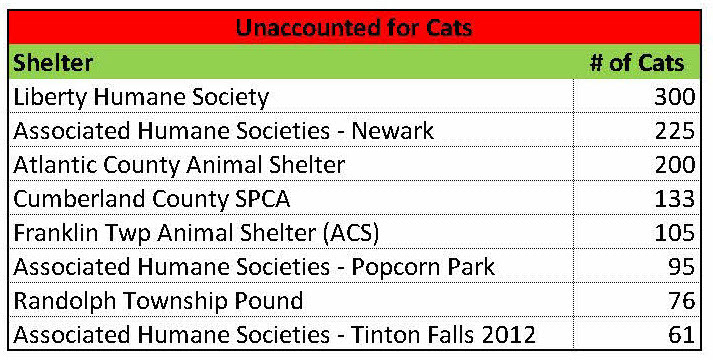 As for AHS-Tinton Falls being nearly no kill, that would be a huge stretch. They’ve had similarly high cat kill rates as reported in 2012 going back to 2002 (and probably way before that). Furthermore, given all three AHS facilities had large numbers of unaccounted for dogs and cats in their most recent Shelter/Pound Annual reports, I’m not exactly comfortable with their data either. AHS-Tinton Falls should still have been able to complete the Shelter/Pound Annual Report this year given most of the data needed for the report must be retained per NJ shelter laws. Are you asserting AHS-Tinton Falls violated this law? Finally, speaking out and demanding change has resulted in many shelters across the country to radically increase their save rates. To blindly argue for spay and pray, will not save the animals. Proven effective policies will. All you have to do is submit that late report I am sure they would be happy to revise their numbers. Instead of acting guilty, which you are – you did not submit your report – reason does not matter – be polite and professional like Trish above . I remain one of those animals activists . NJ Animal Observer, TY for continuing gathering information on the state of the NJ Shelters, you have and continue to compile valid and factual data that will hopefully help lead to much needed reform in NJ. Well written. wow what an eye opener……. njanimalobserver–You did an awesome job bringing this to the attention of all of us. It is very sad the reality of this.